This issue’s cover illustration is from Elmer’s Weather by David McKee. Thanks to Andersen Press for their help with this July cover. By clicking here you can view, print or download the fully artworked Digital Edition of BfK 207 July 2014 . The Writing for Young People MA at Bath Spa University consistently brings forth writers who are producing interesting, sometimes quirky novels. This story is one such example. Set in an unspecified time, but with clues that it might perhaps be early Victorian, it tell of Lulie Mayville, who is summoned to the palace to serve the Lady Wilhelmina, who is about to marry the Prince Antineo of Langden. After the wedding Lulie serves the now Princess Wilhelmina and quickly discovers all is not well with the marriage, not least because the Prince has eyes for another lady. When Mr. Verey comes to paint the Princess’ portrait it is soon obvious that there is an attraction between them. But the Pauper’s Pox, which afflicted Lulie’s mother, now claims another victim, the princess herself. Lulie overhears plans to get rid of her mistress and the two of them plan to run away. Aided by Georgie the gardener’s son, leave in the night and find themselves in Folestoken after an offer of a job is made. 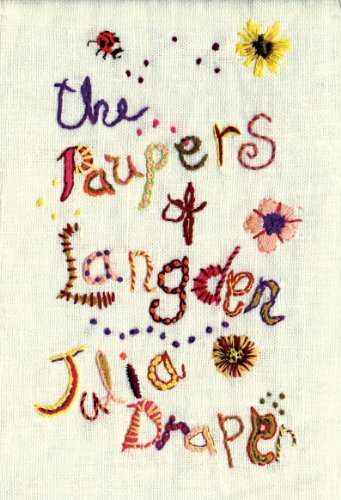 There they settle and Lulie at last sees the sea, but the bunglnappers (fantastic name! ), are seen in the town, an indication that they have been discovered. The author has a nice way with words and some lovely phrases, and bunglenappers will stay long in my mind. Where does Folestoken bring to mind? This is an enchanting story with a little romance, a villain, adventure, and a spunky heroine. The people that the girls meet on their way, especially the lovely Mr. Wilberswick for whom they keep house, are real characters who warm the pages, a contrast to so many other stories. This is a beautifully written story which reads a bit like a fairy tale and one can look forward to further tales of Lulie.